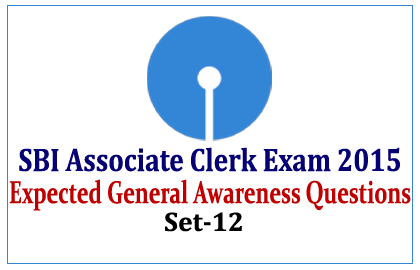 List of Expected GK Questions for the upcoming SBI Associate Clerk Exam 2015 were given below. Candidates those who are preparing for those exams can use these questions to score more marks. 1).What is the facility that provided by the bank in case of depositor’s death they pay the balance in the account of the person name by him/her? 2).Which is the largest shareholder of a public sector bank? 4).Among the following, which is NOT a money/finance related term? 5). Shiva Chowrasia is related to which games? 6).Why Foreign Direct Investment (FDI) is preferred, other than the inflow of foreign funds. a) It brings in latest technology in the country. b) It generates huge employment opportunities. c) It improves international ties of the government. d) It stays in the country for at least five years. 7).Which of the following body and Central Government together finalizing the marketing borrowing programme of the state government? 8).The issue of fresh securities by an unlisted company for first time is called? 10).Among the following terms, which is NOT used in Hockey?